Kaelin Moser-Viteri, b/k/a Moses, a tattoo artist of Ecuadorian descent, was born and raised in the bluegrass state of Kentucky where his affinity for art, design and tattooing began at a young age. He sharpened his drawing skills watching and re-creating his favorite cartoon and Anime characters. Moses grew up influenced by the intersection of punk rock, punk rock-inspired art and graffiti culture; with interests in comic books and animation. 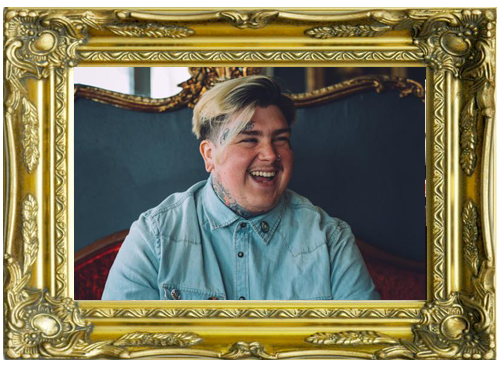 He developed a love for tattooing and body modification at a young age, becoming a fixture at his local shop and getting his first work done at the age of 16. Shortly thereafter, he began a tattoo apprenticeship at a shop in Northern Kentucky. After a nearly 5 year stint, he continued his apprenticeship in the Cincinnati tattoo scene. He’s been professionally tattooing in Cincinnati since October 2014. Get Up Tattoo Society, to me, is more than just a tattoo shop. We have society in the name because, in my opinion, that is what we want it to be, essentially. A place where you feel comfortable to get tattooed. [We want to] build a solid relationship between client and artist, have an overall welcoming feel, and chill vibe to the entire experience. GUTS is a family. I can cook a breakfast like nobody’s business. I am the iron chef of pre-lunch feasts. The ruler of all things egg. The master of early munchies. I am the bacon barbarian. Cookin’ up dope concepts to make your mouth water..